COSTS, BENEFITS OF AN ENERGY FRENZY. On state land near Ucross, Wyo., a wastewater pipe dumps coalbed methane wastewater into a pond (top left). The area was scraped clean by the operator, then abandoned. Drill rig near Clearmont (top right), with wastewater. A compressor station near Gillette (bottom right). Drillers in an early winter storm (bottom left) snap-punch a coalbed methane hole near Clearmont in the heart of the Powder River Basin. About 18,000 people were directly employed in the oil and gas industry in Wyoming at the end of 2004, according to the Petroleum Association of Wyoming. THE WINNERS, THE WARRIORS AND THE LOSERS. 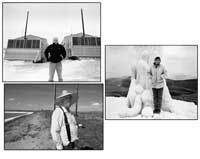 John Kennedy (top left), owner of Kennedy Oil, an independent oil and gas company based in Gillette, Wyoming, in front of two large compressors used to move the methane from the wells to bigger pipe lines. Jill Morrison (above), executive director of the Powder River Basin Resource Council, the main watchdog group for mineral development in the Powder River Basin. She stands next to an ice tower formed by methane well wastewater, the result of an industry strategy to dispose of water by 'atomizing' it. Sprayers shoot water mist into the air in hopes it will evaporate. John Dewey (left) is a ranch owner east of Sheridan, Wyoming, whose land borders a huge compressor facility. He has gas wells on his property and says his water wells have been ruined by the development. Behind him are new power lines and a wastewater holding pond. Though Dewey owns some of the mineral rights to his land, he says the ranch is now uninhabitable. WHAT WILL BE LEFT? Geese fly over a herd of cattle moving across undeveloped land near Lake de Smet, north of Buffalo (far left). Just to the east is state land scraped bare by cbm operators, with a wastewater pond and an 'atomizer' (near left). PHOTO EXHIBIT images by Ted Wood, as well as the work of photographers Ann Fuller, Pat Smith and John Amos, will be featured in an exhibit on coalbed methane development in Wyoming's Powder River Basin, Jan. 20-March 17, 2006, at the Uncross Foundation Art Gallery, in collaboration with the Powder River Basin Resource Council. Call 307-737-2291 or 307-672-5809. PINEDALE, Wyoming — The cottonwood leaves flutter gold in this small town on a recent October morning. Pickup trucks towing horse trailers rattle along Pine Street. Coffee drinkers huddle over the tables at the Stockman’s Restaurant. And on the sagebrush expanse outside of town, natural gas drillers are hard at work. In Ron Ruckman’s fifth-grade class at Pinedale Elementary School, the students present reports on the planets of our solar system. Ben and Riley describe Mercury, which is undeniably rugged and hot; Tomara and Aiden tell the class about Saturn’s otherworldly beauty. Not that planet reports are anything unusual; they’re standard elementary school fare. But in this class, the technology itself is space-age. The fifth-graders did their research using the school’s new fleet of laptop computers and its high-speed wireless Internet system. The students created Powerpoint presentations, and now, with the room lights dimmed, they’re showing them on a $5,000 "computerized smart board" — one of 10 new blackboard-sized touch-screen displays in Pinedale’s schools. The technology is impressive, because Pinedale is as rural as they come. The primary settlement in 4,800-square-mile Sublette County, it has only about 1,600 residents. Ruckman’s students are mostly ranch and gas-industry kids. About 40 percent of the kids have no computers in their homes. Ruckman says the school’s technology is a smart investment, one that will prepare generations of local people to succeed in the future. "The kids will push the technology now," he says. "They’ll ask for it, and they’ll push the teachers’ use of technology, too." And there’s another reason to be impressed by Pinedale’s schools: The teachers here are the highest-paid in Wyoming, including Jackson, one of the West’s wealthiest resort towns. This year, Pinedale’s teachers will make, on average, more than $50,000 each. All around Pinedale, there are signs that the town is at least keeping up with the Jacksons. Recently completed local projects include a new hockey rink, a riding arena at the fairgrounds, a major courthouse renovation, a new senior center, new county shops, hiking paths, and a $600,000 practice field for high school athletics. Next spring, construction will begin on an $11 million public aquatic and sports center, which will have three pools, racquetball courts, exercise equipment, a running track, and a climbing wall. The county government has also offered to provide funding for another new rec center and a $3 million bowling alley. And the rural health-care district provides the buildings for two clinics, and attracts doctors to the area with guaranteed salaries. Who pays for all this? Not the ranchers who, at first glance, seem to characterize the community. Nor is it the few lifestyle immigrants who have found their way here from urban places like Florida or California. Almost all the bills for government projects and schools are paid by the energy industry — the gas drillers hard at work out in the sagebrush. The industry will pull more than $3 billion worth of gas from Sublette County this year, and pay more than $320 million in taxes to local governments, schools and the state. Much of that revenue will go to help other Wyoming communities, but about $44 million will stay here in Sublette County, making this community, as a whole, fantastically rich. And this is true of all of Wyoming: From the Red Desert to the Powder River Basin, increasing oil and gas prices have spurred the already fast pace of drilling to a headlong gallop. This year, the industry will produce about $12 billion of oil and gas in the state. In return, it will pay Wyoming government entities about $1.5 billion in total taxes, royalties and lease payments. Other Western states, most notably New Mexico and Colorado, are also enjoying a surge in tax revenues from oil and gas production. Taxes on this industry have become a hot topic, sizzling all the way up to Congress. With many oil and gas companies currently racking up record profits, some Westerners think they should be taxed at higher rates. No doubt, some of the states could do a better job of collecting, spending and investing their oil and gas revenues. Sooner or later, this energy frenzy, like all the others, will die down. The way state and local governments act today will help determine what the region looks like in the future. The West could use its tax bonanza to go on the equivalent of a three-day bender. Or the region could plan ahead, and use the money to help itself break free from the eternal cycle of boom-and-bust. Wyoming seems to have learned the most about booms and busts and taxes. The state has ridden the ups and downs of its resource-dependent economy like the bronze bronc rider in the capitol rotunda in Cheyenne (HCN, 2/17/03: Wyoming at a crossroads). Wyoming’s oil and gas industry first came out of the chute in the early 1900s, when drillers hit gushers around Salt Creek, north of Casper. That oilfield became one of the largest in the world, says University of Wyoming associate history professor Phil Roberts. Wyoming’s industry soon fell prey to national and global economic swings, however, busting and booming erratically three times over the following century. The current boom began around 2000. Those ups-and-downs had dramatic effects. In the 1970s, for example, the oil workers who rushed into industry towns overwhelmed government services. Rock Springs had wide-open prostitution and gambling; its corrupt cops were so notorious they were featured in an episode of 60 Minutes. In Gillette, motels rented beds in eight-hour shifts, offering roughnecks some of the only affordable housing around. The town of Medicine Bow went from 300 people to 2,000; after the late-1980s bust, it shrank back to 350. During an earlier bust, in 1969, then-Gov. Stan Hathaway suddenly realized the government was broke. "The treasurer reported there was only $58 in the state’s operating account, and Hathaway saw no other choice but to put a tax on minerals," says Roberts. At Hathaway’s urging, the state Legislature approved a severance tax — a percentage of the value of the minerals "severed" from the earth each year. 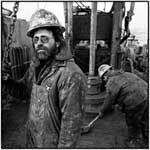 Many of the legislators who approved the tax, and subsequent increases over the years, were oilmen. They believed that, even in hard times, their industry should share the tax burden with ranchers and farmers. "They were statesmen," Roberts says. "Even if (imposing the tax) wasn’t in their own financial interest, they knew it was in the overall interest of the state." Hathaway also pushed to set up the Permanent Wyoming Mineral Trust Fund, where some of the tax revenues are saved every year as a long-term investment. He coined a phrase — "Growth on our terms" — that still echoes through the Statehouse, letting companies know that they’re welcome to drill, as long as they pay the toll. And the toll is substantial. The industry pays so much in direct taxes on its production, the state does not have to charge an income tax on any companies or on Wyoming residents. Today, Wyoming has about $3.3 billion set aside in a couple of trust funds, mostly built with oil and gas revenues. The earnings — hundreds of millions of dollars per year — help fund schools and other government services, even when the industry’s in a slump. With the production currently soaring, the state’s annual budget has a surplus of hundreds of millions of dollars. Wyoming State Rep. Steve Harshman, R-Casper, would like to stash an even bigger portion of the cash flow in trust funds. This year, he convinced the Legislature to authorize putting $400 million into a new fund for scholarships at the state university and community colleges. He estimates that when the fund is filled within a few years, 70 percent of the state’s annual crop of high school graduates will be eligible for those scholarships. "Boy, then we’re set for good," he says. Recently, Wyoming has found other uses for its oil and gas revenues: It has set up trust funds for preserving wildlife habitat, assisting military families, and creating endowed professorships, pledging $105 million to attract world-class faculty to its university and community colleges. The state also provides $80 million a year in new assistance to entrepreneurs and local economic development projects. There’s talk of creating a new business college in Jackson, setting up a new energy-studies program at the university, and expanding health insurance for low-income families. Wyoming still has problems, including a shortage of well-paying jobs outside the energy industry. But with its investments of the tax revenues, "I can’t think of a better place to be in the next five years," Roberts says. "We’re right on the edge of some great things." None of the other Western states seem to be using their oil and gas revenues as innovatively as Wyoming. Typically, most of the money goes to general support for schools, and to construction of roads and water projects. New Mexico will produce $12 billion worth of oil and gas this year, while dinging the industry for $1.8 billion in taxes and royalties. And the state taps the earnings of trust funds that hold about $10 billion of oil and gas revenues. Gov. Bill Richardson, D, and the Legislature felt so flush this year that they spent $216 million giving income tax rebates, cash payments or other tax breaks to residents, partly to help them cover their rising energy bills. For a couple of years, Richardson has also successfully pushed to devote more state money to improving New Mexico’s education system by giving teachers raises and extending services to more kindergartners and even four-year-olds. But Kay Monaco, director of New Mexico Voices for Children, a group that advocates for social services for low-income residents, says more needs to be done to address the state’s full range of needs. The tax rebates weren’t a good idea — they "have already come and gone," without any lasting effect, she says. And despite the increased spending on schools, the state has abysmal rankings in many categories: the highest rate of child poverty, the highest percentage of minimum-wage workers, the second-highest rate of uninsured adults, a high rate of adults without a high school diploma, and 49th in testing scores for fourth-graders and eighth-graders. "We have a plethora of needs," Monaco says. "New Mexico is woefully unprepared to compete in today’s economy. We don’t have a skilled and educated workforce. But (the oil and gas revenue) could be a turning point," Monaco says. Monaco says the state should use at least $300 million to set up a new "social infrastructure" trust fund to generate earnings, year after year, for adult education and better daycare for kids younger than four years old. "Research shows that most brain growth happens in kids up to 3 years old, and that is a time when they need brain stimulation. If we can provide quality early care and education, it will have long-term effects on children’s ability to learn." Diane Denish, New Mexico’s lieutenant governor, says the administration will ask next year’s Legislature to allocate another $109 million for pay raises for teachers, and $8 million for hiring more physical education teachers. The governor may also seek support for companies that do "commercial space development," such as selling space flights to rich people. And legislators will inevitably divert money to pet projects in their home districts, Denish adds. Nonetheless, Joe Monahan, a former journalist who writes a weblog covering the state’s politics, says, "I have been disappointed so far by the political and business leadership. I haven’t heard them talk much about this opportunity. It’s an absolutely stunning amount of money, and I think it has put lawmakers back on their heels." Colorado’s energy production has lagged behind Wyoming’s and New Mexico’s over the decades. Even so, the state has produced at least $1 billion worth of oil and gas almost every year since 1981, and this year it’s expected to top $8 billion. Many people believe the state should have more to show for it. One of Colorado’s oil and gas trust funds doesn’t generate much in earnings, because state law doesn’t allow the fund’s managers to invest in the stock market. And Colorado’s Legislature has raided the other fund for about $100 million since 2001, for purposes like settling a water dispute with Kansas, handling a forest-fire crisis, and assisting low-income people with energy bills. Colorado also has a tortuous system of tax formulas and deductions for the oil and gas industry. An economist with the Colorado Legislative Counsel office recently found that Colorado’s effective severance tax rate, when deductions are factored in, is only 1.8 percent on the value of oil and gas production. The other Rocky Mountain states have rates ranging from 3.8 percent in Utah to about 8 percent in Montana. And Colorado’s formulas cause big swings in the state’s severance tax collections. From 2000 to 2004, while the value of the state’s production of natural gas climbed steadily from $2.8 billion to $6 billion, the annual severance tax collections fluttered from $24 million, to $54 million, to $48 million, to $23 million, and then to $107 million. Meanwhile, Colorado’s schools need at least $6 billion for construction and repairs to address "very dire health and safety circumstances," says Mary Wickersham, director of special projects at the Donnell-Kay Foundation in Denver, which works on school issues. In some districts, one-fourth of the students attend classes in trailers. There’s a shortage of technology and science labs, and more than 50 schools have roofs that need to be repaired or replaced. One school last year needed giant steel cables to lash its walls together, she says, and others have fumes from backed-up sewage and malfunctioning furnaces that spew out carbon monoxide. "The last energy boom in Colorado (25 years ago) came and went, and we didn’t really put any money aside for leaner times," says Colorado State Rep. Kathleen Curry, D-Gunnison. "We used it, and now the same thing is happening again." To be fair, some of the differences between the states have to do with population: Wyoming spreads its oil and gas revenues over only a half-million people, compared to New Mexico’s 2 million and Colorado’s 4.6 million. And New Mexico and Colorado have shown innovative thinking in their use of state lottery revenues, devoting that money flow to college scholarships and private-land conservation, respectively. But this oil and gas boom presents a spectacular opportunity — along with big trade-offs — everywhere it’s happening. Curry is among the growing chorus calling for higher taxes on oil and gas drillers in Colorado — or at least for changes in the way that money is disbursed. "There are weaknesses in the tax structure, in the tax rate itself, and how we charge it, and the end use of the money," says Curry, whose district includes gas fields. She wants to increase the severance tax, and restructure the formulas so that more of the money goes to social service programs. Local governments bear the brunt of the industry’s impacts, and some officials want more money so that they can respond effectively. "It hits us everywhere," says John Martin, a commissioner in Garfield County, which sits amid the burgeoning gas fields of northwest Colorado. The industry wears out roads with its increased truck traffic, Martin says; power lines and water systems are overstrained. Homeowners want tougher regulation of the industry, and the county has spent $300,000 lodging protests with the Colorado Oil and Gas Conservation Commission, which oversees the drillers. Garfield County has hired a full-time staffer to watchdog the industry. It will spend $1 million this year to study drilling’s impacts on drinking-water wells, property values and human health. And it is spending another $150,000 to monitor air pollution caused by the industry, and determine its possible health impacts. "We’ve seen an increase in asthma, bronchial pneumonias, eye irritations, we’ve even had some tumors," Martin says. But once the state government, schools and other entities take their cut of the tax revenues from the industry, only a small fraction — $9 million — will go to Garfield County this year, Martin says. That’s about 15 percent of the county government’s budget, but still, he says, it isn’t helping "as much as people think it is." The Donnell-Kay Foundation hasn’t endorsed Curry’s idea of raising Colorado’s severance tax, but says the Legislature should at least consider it; tacking an additional 2 percent onto that tax rate would bring in another $120 million in 2006, to help with the backlog in school construction, the foundation says. It would also like to see more of the money stashed in trust funds, and an end to the wild swings in the way the severance tax is collected. Next door in Utah, severance tax collections jumped to $53 million this year, a 45 percent increase from last year. But a commission appointed by the governor and Legislature says the state’s tax rate is relatively low; it’s currently considering whether to call for an increase. California has a huge budget crunch, despite the fact that it’s one of the top states for oil production. There’s no state severance tax to speak of; the state mostly imposes a form of property tax on the industry, and thus receives little in return. "Right now, California would be an absolutely fantastic place to introduce severance taxes," says Juan Carlos Boue, a London economist who studies tax rates around the world. "At these prices, you could literally solve California’s budget crisis with the stroke of the pen." The possibility of higher taxes on the industry made national headlines recently, after hurricanes damaged oil and gas operations just off the Gulf Coast. Gasoline and natural gas prices, already high, soared even higher, amid widespread accusations of profiteering. Leading companies reported record-breaking year-to-date profits, and the U.S. Senate summoned energy executives to Washington, D.C., to discuss the matter. Many in Congress, including Western Democrats, want to impose a new windfall-profits tax on the industry. Congress imposed the first windfall-profits tax in 1980, during an Iran-Iraq war that caused oil prices to soar. Then Saudi Arabia opened its oil spigots and flooded the global market, causing prices to plummet in 1982, and Congress ended that tax in 1988. The industry says that reviving the federal windfall-profits tax would put United States companies at a disadvantage as they compete with foreign companies. "The windfall-profits tax (in the 1980s) was a total flop," says Raymond Plank, chairman of the Houston-based Apache Corporation, which operates oil and gas wells around the world. "It did nothing but interfere" with U.S. companies’ efforts to develop new fields in this country, he says, and it helped make the U.S. more dependent on imported oil. U.S. oil production has been decreasing for decades, while our consumption has steadily increased, so today, the country imports nearly 70 percent of the oil it consumes. Yet many other countries have raised their tax rates or made profit-sharing deals in recent years, aiming to capture more of the companies’ recent profits. Oil and gas taxes in the United States are now among the lowest in the world. In the U.S., depending on where a company operates, the government take ranges from about 40 percent to 60 percent, including state and federal income taxes, says Chuck Logsdon, an Alaska consultant who used to be the state’s chief petroleum economist. Many major energy-producing countries have government takes higher than 70 percent, including Angola (72 percent), Russia (80 percent), Norway (86 percent), and Venezuela (90 percent), according to IHS Energy, a consulting firm based in Englewood, Colo.
"It’s the right time for countries with lots of reserves to cash in, and make a lot of money off what they have now," says James English, an international analyst with Gustavson Associates Inc., a consulting firm based in Boulder, Colo.
Any such move will meet resistance from the industry, however. "We’ll probably be fending off a lot of proposals to add new (state) taxes," says Greg Schnacke, executive vice president of the Colorado Oil and Gas Association. "The industry is not hard-hearted. There may be some proposals that are less onerous than others." Schnacke adds, "Some people want to put (higher) taxes on the industry to shut it down." But Wyoming State Sen. Cale Case, R-Lander, believes states could increase taxes modestly without slowing down drillers much. "Our taxes have so little to do with anybody’s decision; the market price (of oil and gas) is the determinant, both for exploration and for increasing production from older wells," says Case, who holds a Ph.D. in resource economics from the University of Wyoming. In 2000, skeptical of the industry’s pleas for tax breaks, Case persuaded fellow legislators to commission a series of studies of oil and gas taxes in the state. University of Wyoming economists found that doubling Wyoming’s severance tax would increase tax collections by 90 percent, while causing the state’s total production over the next 40 years to drop by only 6 percent. Other states would see the same effect, the economists concluded. The industry’s complaints about taxes "just didn’t pan out," Case says. "It’s clear from our analysis that these resources in Wyoming would sustain higher taxes — it’s not going to affect the behavior of the producers, and the state would reap more money." Predicting how long any boom will last is risky. But many experts believe the global demand for gas and oil will continue to rise. With the energy appetites of China and other developing countries increasing, prices are likely to remain high. It’s unlikely the drillers will soon find themselves out of work. In August, at an industry conference in Denver, Peter Dea, CEO of Western Gas Resources Inc., predicted that companies will drill about 400,000 new gas wells in the Rockies during the next 15 years, to meet demand. The companies will likely make tens of billions of dollars in profit on those wells. Little Pinedale, with its state-of-the-art school facilities and other community projects, is flush with tax revenues partly because of some idiosyncrasies in Wyoming’s formula. Pinedale’s schools get to capture so much of the money that they receive five times the state’s per-student average. But Pinedale also shows how the locals have to pay the long-term price. The flood of industry workers is transforming the surrounding landscape. Two man-camps are under construction — collections of pre-fab buildings and central kitchens, plopped down in the sagebrush — to house more than 1,000 workers. "They bring (the modular housing) in on skids, and take them away when they’re done," says Judi Adler, a member of the county planning commission. Man-camps also came and went during the 1980s, but that boom "had a much smaller footprint" than today’s, Adler says. Another kind of man-camp is rising right in town — a new 100-room motel that will be rented by Halliburton for five years, to house its workers. "A hundred men in the middle of Pinedale — that would be an impact in any small town," Adler says. Many of the workers in the outlying man-camps will also drive to town to socialize in bars, and then drive back not exactly sober, making local highways more risky for everybody, she says. Traffic in town is already way up. There’s also been an increase in burglaries, and in methamphetamine abuse and production (HCN, 10/3/05: Methamphetamine fuels the West’s oil and gas boom). "We’ve lost our sense of safety," Adler says. "We lock our cars and our houses now. We truly never did that." The price of houses in town has doubled over the past five years, largely because the industry pays so well. Other local employers can’t afford to match the pay, and so they have a much harder time recruiting workers. Some restaurants have had to close down temporarily due to the worker shortage, and the longtime owners of the hardware store recently sold out for the same reason. The county sheriff’s department has five deputy positions vacant. And the environmental impacts are starting to show. The once-excellent air quality has declined; the famous Wind River Mountains are often veiled in haze these days. And the drilling is threatening the area’s world-renowned wildlife, including tens of thousands of deer, pronghorn and sage grouse. "These are very fundamental changes," Adler says. "And we know we’re at the beginning — it’s only going to grow worse." Many people here think that even Pinedale’s tax bonanza can’t compensate for all that. Ray Ring is HCN’s Northern Rockies editor. He writes from Bozeman, Montana. A sidebar article, "Energy companies plow some profits back into Western ground," accompanies this feature story.